AN OPEN BOOK is an interactive visual art exhibition featuring work by Barbara Ellmann, a Brooklyn-based painter who has worked as a teaching artist in museums, classrooms, and professional development workshops for over 30 years. For this exhibition, Ellmann draws on her own artistic practice as well as her experience in aesthetic education to examine the mutual influences of teaching and doing. AN OPEN BOOK has no wall text, emphasizing visual language over verbal to offer visitors a number of ways to interact with and explore the artwork guided by their own curiosity, impulses, and questions. The exhibition has two components: the work, which includes encaustic paintings and works on paper by Ellmann, and the lab, which provides resource materials and hands-on activities that contextualize Ellmann’s artistic process. Together, the artwork and the lab materials create opportunities for social interactions, playful exploration, and intentional meaning-making for visitors in the gallery space. By bringing these two components together in the one space, AN OPEN BOOK seeks to close the gap that occurs when arts education takes place in classrooms separate from physical works of art. The exhibition’s format teases the understanding that there can be deeper engagement with the work on display, inviting multiple viewings and extended inquiry. AN OPEN BOOK provides an opportunity for fruitful partnership and collaboration among exhibition spaces and education programs. To date, the show has toured to two locations, and has been used by researchers and educators as a tool to examine the reflexive natures of artistic practice and aesthetic education. Learn about previous iterations of AN OPEN BOOK here. Would you like to host the next iteration of AN OPEN BOOK? Contact us! 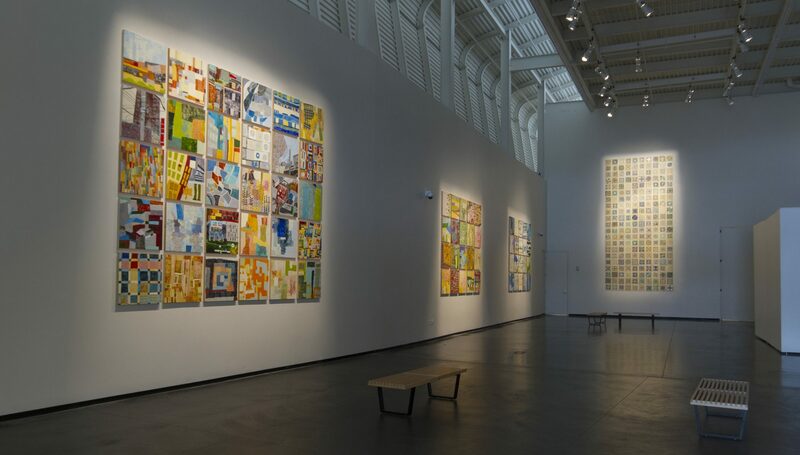 Barbara Ellmann has been working with encaustic paint for over twenty years, creating individual 24″ square paintings, and exhibiting them in multi-panel grids of varying dimensions. Her practice explores the way that we process and catalogue visual experience, and the paintings represent her response to place. These arrangements were created site-specifically by Ellmann and curator Sophia Marisa Lucas. As AN OPEN BOOK tours, the grids may be modified to respond to the dimensions and needs of each exhibition space, while still maintaining the character of what the artist originally conceived. The unfixed, permutable nature of these groupings allows for unique interactions among individual panels. When brought into conversation with the lab materials in the gallery, the grids invite visitors to engage with the work by following their own eyes, and to bring their own associations to the abstracted imagery. One important area of AN OPEN BOOK is designated for the display of contextual materials about the artist’s process. It is a visual information lab where questions and curiosities that are piqued within the exhibition can be developed, leading viewers to engage further with the work. An iPad app that allows visitors to digitally rearrange the panels in PICTURE IT, one of the grids of paintings featured in the show.